Your Wedding To Do List is a critical part of your planning. You’re welcome to use our FREE Detailed Wedding To Do List and Wedding Planning Checklist as you plan your perfect day. Our Checklist is completely flexible so you can add items depending upon the size and formality of your ceremony and reception. It’s filled with tips on what to do and when to do it to ensure everything runs smoothly. It’s broken down into several sections to help you plan your ceremony and reception. You’ll find our Checklist to be a handy guide to have by your side as you prepare for one of the most important days of your life. 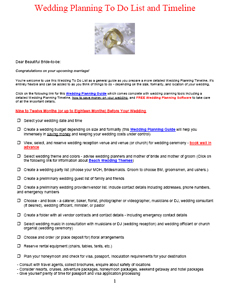 Click on the link below for immediate access to our FREE detailed Wedding To Do List.